Ted Hood was a passionate sailor who won the America’s Cup on Courageous in 1974 and parlayed his love of the sport into a 64-year career as a sailmaker, boatbuilder, boat and rigging designer, spar maker and innovator. Ted Hood was a passionate sailor who won the America’s Cup on Courageous in 1974 and parlayed his love of the sport into a 64-year career as a sailmaker, boatbuilder, boat and rigging designer, spar maker and innovator. Hood, whose actual name was E. Frederick Hood, died June 28 in Middletown, R.I. He was 86. Hood founded Hood Sailmakers, the world’s largest sailmaker in the 1960s and ‘70s, and also built Little Harbor cruising yachts and later Down East-styled Whisper Jet powerboats. He adroitly navigated the tempests of a changing sport and industry, applying his restless and fertile mind to help coax yachting into the 21st century. He started out repairing cotton sails, taught himself how to make them and gravitated to synthetic materials — developing and weaving his own Dacron material with technical assistance from his father, Stedman Hood, “the professor,” who was an engineer and chemist. He designed rigs and masts, built masts — one yachtsman called Hood “the Rolls-Royce of spar makers” — and went on to pursue a passion for boatbuilding and design. He designed cruising yachts and high-end powerboats, as well as two America’s Cup contenders, Nefertiti and Independence, on which he competed in defense of the Cup in 1959 and 1977. Those accomplishments started with his love for sailing. “Ted, from his first voyages in a basket in the bottom of a cockpit, never wanted to do anything but go sailing,” his father said in a 1967 profile of Hood in The New Yorker magazine. Hood built his first sailboat when he was 9 years old, fixing a mast and centerboard to a flat-bottomed rowboat he built and fashioning a hand-me-down piece of canvas into a sail. He was a crackerjack racing sailor in his youth, winning the Mallory Cup — North America’s most prestigious sailing championship — in 1956. And he was always “tweaking,” Ted recalls, running around the boat adjusting this and adjusting that — constantly searching for the perfect trim for that moment. He was named Yachtsman of the Year in 1974 after winning both the America’s Cup in a new Sparkman & Stephens 12-Meter named Courageous and the prestigious Southern Ocean Racing Conference in Robin Too II, a boat of his own design. Known as “sailmaker to the twelves,” Hood built sails for most of the 12-meter Cup campaigns from 1958 to 1987 and could be counted on to deliver service to his competitors that was every bit as good as the service he gave his own boats when he was racing against them. “He was a truly honest sportsman,” Doyle recalls, and always up for a challenge. Asked to build a singlehanded circumnavigator, Hood delivered the 60-foot American Promise to Dodge Morgan, which he soloed around the world in a record 150 days in 1985-86. Hood also was an innovator. “He was never afraid to look forward,” Doyle says. He encouraged his employees to do the same. If he liked an idea, he didn’t talk it to death. “He wanted to get it out there, try it, see if it worked,” Doyle says. If it didn’t, he told his people not to be embarrassed. He encouraged them to test new ideas. 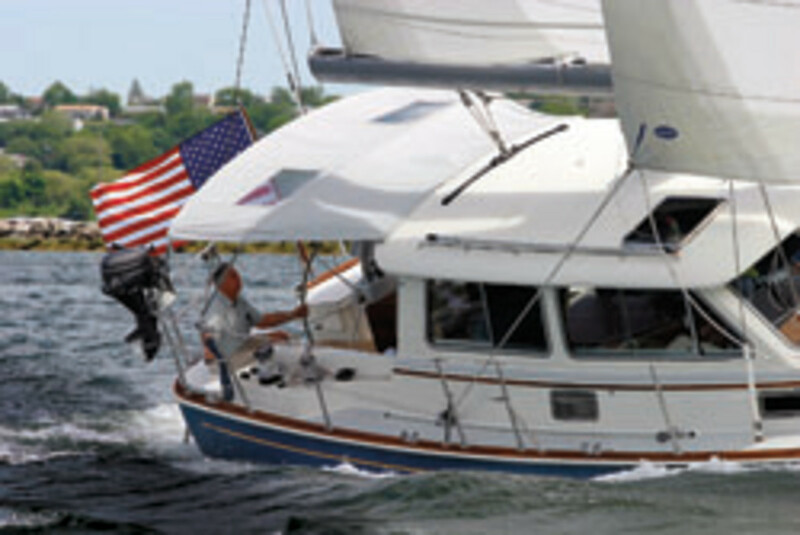 Among Hood’s innovations: the grooved headstay, the dip-pole jibe, the roller furling jib, the Stoway mast, the stowboom, the cross-cut spinnaker. “Whatever he touches — and he touches practically everything — ends up significantly better than what was there before,” Nautical Quarterly said in an article on Hood. If Hood was an innovator, he also was very much an individualist. He went his own way. “He was a contrarian,” recalls Bruce Livingston, who ran Hood’s Little Harbor sailboat production operations in Taiwan, Singapore and the United States for 14 years and now directs production for Grand Banks Malaysia. Inspired by Carleton Mitchell’s “fat yacht” Finisterre, which won the Newport-Bermuda Race three times in the ’50s and early ’60s, Hood developed beamy, shallow-draft, high-aspect ratio, centerboard, heavy-displacement sailboats that delivered good speed on a reach, seakindly performance and plenty of volume for cruising. “On a close reach, they were very good,” Livingston says. And the more you loaded it up, the better it performed. “A lot of people liked his boats,” Livingston says. 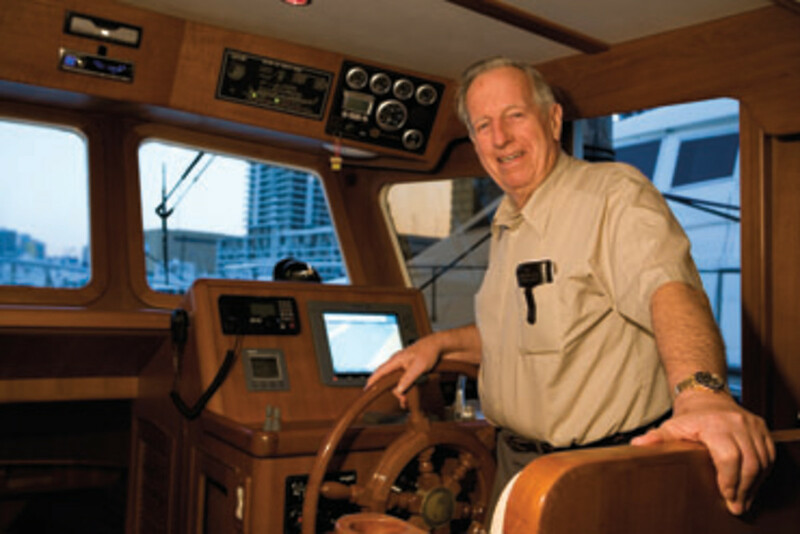 In the 1980s Hood sold his sailmaking business in the Little Harbor section of Marblehead and opened the Ted Hood Marine Complex on a surplus World War II fuel depot in Portsmouth, R.I., while turning his focus to boatbuilding. Hood helped pioneer the move toward building offshore. He already had built some boats in Japan and Holland when in 1979 he began building in Taiwan, which he continued to do for 14 years, later moving his construction operations to Singapore, Turkey, Poland and China. “Ted’s primary goal was high-quality workmanship for good value,” Livingston says. Hood brought Livingston in to turn a commercial fishing boat factory into a yacht-building operation. He says Hood learned early on that succeeding in building overseas is “all about how operations are managed, how people are put together as a team. Like Doyle, Livingston says Hood focused single-mindedly on improving the quality and design of his boats and building them more efficiently. Seeing explosive growth in the powerboat market, Hood bought Black Watch, a builder of Ray Hunt-designed sportfish boats, and manufactured them under the Little Harbor brand. In 1990, Hood came out with his first Down East-styled boats — a 34- and 36-footer — which pioneered the traditionally styled express cruiser so popular today with older sailors easing out of sail into a genteel powerboat. Son Ted says his father began powering the Little Harbors with water jets so he could build them with a shallower draft for wider cruising. “That was just another piece of the whole puzzle,” he says. In 1999, Hood sold Little Harbor to an investor group that two years earlier had bought The Hinckley Company, builder of the Picnic Boat. Ted Hood Yachts, his latest venture, builds expedition motoryachts and motorsailers, power catamarans and fast explorers. He is survived by his wife of 58 years, Susan Blake Hood, and children Richard Hood and wife Carroll McGrath Hood, Frederick “Ted” Hood and wife Anne Vandromme-Hood, Robert Hood and wife Sarah Hood, and Nancy Hood-MacLeod and husband Norman MacLeod. This article originally appeared in the August 2013 issue.